Vagabund Brauerei was funded by a German crowdfunding campaign. I was born in Los Angeles, but unless you polled only my mom, my absence is hardly felt. Nearly 4 million people call it home, and if you include the suburbs that make up the Greater Los Angeles Metro—and some say that all of LA is just an unceasing smattering of suburbs even though they’re wrong—then the population swells to over 16 million. That should be a lot of beer drinkers, but only recently has it developed a true beer culture. Inexplicably, Berlin is quite similar, despite the fact that Germany is where many—apparently Bob Dylan and Chrysler included—proclaim the best beers in the world are brewed. But the past is the past, and few places embrace the here and now—if not the future—like Europe’s and the United States’ second-most populous megalopolises, respectively. With near parity in number of local breweries, just over a dozen each, and innumerable top-shelf dining spots and watering holes, it’s time to revisit these future bastions of beer. And of course they’re sister cities! Ich bin ein Berliner, along with 3.4 million others in Germany’s capital, or 4.5 million in the greater metro. It is, of course, famed for its lactic wheat beer, Berliner Weisse, which first appeared in the 17th century but earned its star on the beer map when Napoleon’s troops dubbed it “the champagne of the north.” Today, the only large-scale production remaining in Berlin is the Berliner Kindl Weisse found in the red raspberry flavor or sweetened with green woodruff syrup. Interestingly if not surprisingly, the light-bodied, slightly sour beer has curried favor among American brewers, but there aren’t many Berlin-based breweries reclaiming the style (read more about that here). Brewbaker (Sickingenstraße 9), northwest of the city center in the Mitte borough where many of the breweries and beer hot spots are concentrated, not only makes a brilliant lemony version with a malt base resembling saltines, but it also invented the Berlini, a portmanteau of the peach juice and champagne cocktail Belini and a Berliner Weisse. Visitors may find other adventurous beers on tap ranging from a potato stout to a pumpkin lager. Further afield, breweries now lovingly work in the once-British now-American style realm of ales, which frequently means über hoppy and/or embellished with creative adjuncts. 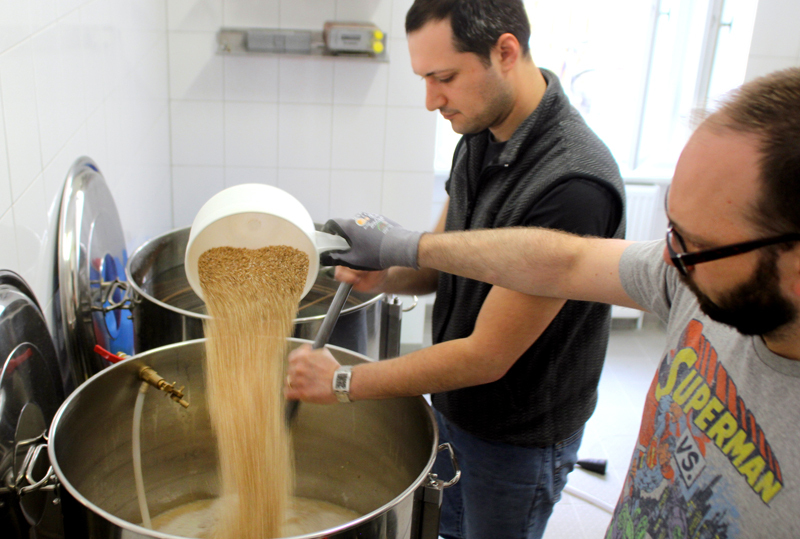 Exemplifying all three of those aspects—hoppy, non-Rein­heitsgebot additives, and Americana—Vagabund Brauerei (Antwerpener Straße 3) is a new startup in Mitte’s Wedding District from three expat American homebrewers, funded by a German crowdfunding platform called StartNext.de. Its Double IPA is made with grapefruit and orange peel and coriander; it works because it actually tastes like those are purely hop-derived flavors. The brewers’ focus is IPAs, but they’re not afraid to go dark such as with their Black IPA, or even darker, politically speaking, with Crimea River, a Russian Imperial Stout. Speaking of DIPAs, Thorsten Schoppe became a godfather of the independent brewing scene by founding Schoppe Bräu way back at the beginning of the 21st century. He also brews at the new brewpub Pfefferbräu (Schönhauser Allee 176), which offers a light and a dark beer plus conventional fair including suckling pig and a Berliner liverwurst, and at Brauhaus Südstern (Hasenheide 69), the ideal place to bring the family for a Sunday roast. But the Schoppe Bräu DIPA I referred to is one that Thorsten told me he wanted to smack of German hops. The result is a beer whose name can’t be printed in these pages, but let’s call it Holy Scheiße (clearly the German version of the U.S. TTB is more lax). It’s bittered with two experimental hops developed in Hallertau including Polaris, a high-alpha hop lending pine and mint flavors, and Mandarina Bavaria—think Hallertau’s answer to the PacNW’s Citra that naturally delivers sweet orange flavors. This H-bomb approaches 10% ABV and further proves the Germans do DIPAs right. Mere blocks away from Vagabund, the basement-level Eschenbräu (Triftstraße 67) props its still—yes, it also makes fruit brandies—in the corner to make more room for guests eager to enjoy half liters of its core beers: a pleasant bitter Pils, a Dunkel that tastes more like an Altbier, and an estery wheat beer. Not a fan of apple brandy but interested to try distilled beer? There’s a liqueur made from a dark bock bier. Speaking of bocks, among its limited offerings released each month, check out E 10, Eschenbräu’s 10% triple bock oak aged with lactic acid. For the kinders, it also sells undistilled, fresh-pressed apple juice. Both the juice and the Pils go down nicely on warm days if there’s room in the biergarten—trust me when they say it “only” seats 200 patrons beneath the central old oak tree. Don’t miss house-baked pretzels and/or flammkuchen (think flatbread pizza). Nearby are two great places to do some bottle shopping and really delve into the depths of German brewing. In Wedding there’s Hopfen & Malz (“Hops & Malt,” Triftstraße 57) and less than three kilometers away is the Berlin Bier Shop (Kirchstraße 23). The former is brand new and the latter is owned Rainer Wallisser, who deserves much credit for developing the rising interest in new breweries. “In Germany,” he says, “we usually call those unabhängige brauereien,’” or independent breweries. Wallisser says that “all kinds of German IPAs are the best-selling beers at this time,” which, again, is pretty impressive given that the land is synonymous with crisp lagers faintly bittered with noble hops. He singles out experimental and educational IPAs by Ale Mania, Kehrwieder and BrauKunstKeller, whose series of single-hopped IPAs includes that sweet clementine-esque Mandarina, thrown off a touch in the aroma by a small portion of smoked malt. Another developing brewery in the Wedding District was originally a gypsy brewer known as beer4wedding, but the three owners are completing construction on a brewpub and will relaunch as Berliner Bierfabrik. They’ve already got their own hops growing. And they’re concocting something even more impressive. Co-founder Sebastian Mergel is the inaugural president of the Global Association of Craft Beer Brewers (GACBB) already with members from every continent (save for brewery-less Antarctica). The first GACBB Festival will be held in Berlin this year, July 25-27, for thirsty denizens of planet Earth. Another festival Berlin hosts is the Wurst & Bier Fest, staged in MarktHalle Neun (Eisenbahnstraße 42) in the Kreuzberg neighborhood, bringing us now southeast of the city center. It offers sausages from white weisswurst to black bloodwurst and my favorite, a traditional bockwurst plucked from a crock of bockbier. In addition, over a dozen brewers set up around the market. Year-round, there’s a basement nanobrewery, Heiden Peters, making beers such as Almost Schwarzbier, which can be enjoyed at a little bar way in the back of the hall or while walking around noshing on pretzels and meatballs. Finally, as long as we’re on the sausage trip, you’ll find currywurst carts and shops all over. These sausages served with curried ketchup (usually in sliced rolls and frequently with fries) are to Berlin what, well, what hot dogs are to baseball. Berliners take their love of currywurst so seriously there’s even a Deutsches Currywurst Museum (Schützenstraße 70). It’s awesome, located a block away from Checkpoint Charlie—the former Berlin Wall crossing. But wait for Das Meisterstück, “the Masterpiece” (Hausvogteiplatz 3-4). It’s a progressive bierhall and sausagehaus with a terrifically crafted list of bottles that are paired with gourmet wursts ranging from the expected currywurst and bockwurst to those stuffed with duck or salmon, all served on house-baked rolls. As the myriad cuckoo clocks on the walls denote, the time to explore Berlin’s beer scene is now. This article appears in the July issue of All About Beer Magazine. Click here for a free trial of our next issue. Brian Yaeger is the author of Red, White, and Brew: An American Beer Odyssey and the forthcoming Oregon Breweries.